Regretting some of those holiday decisions? Me too. When it comes to Christmas cookies, I pretty much loose any and all self-control, shoveling them by the handful into my maw. My poor body, sending me all the signals I’m full (and gluten intolerant), but Russian Tea Cake, after Chocolate Dipped Pretzel, after Iced Sugar cookie go from plate to mouth at warp speed. I don’t remember my jeans being this tight. Transitioning from my holiday eating plan (sugar, fat, booze, salt, repeat) to my normal plant-based-vegan-at-home diet is harder than simply flipping a switch. I’m just not ready to trade in wine for wheatgrass. I plan on easing back into grains, greens, and more greens with breakfast. Some combination of fat, sugar, booze, salt for lunch and dinner. What follows is my usual if I’m not having oatmeal for breakfast. Now, before you move forward, I want you to approach this with an open mind. I know kale is like the Kate Middleton of vegetables, but I’m not stupid. Suggesting kale for breakfast isn’t winning me any friends. I’m going to do it anyway. Generally I prep a weeks worth of breakfast on Sunday. I’ll wash two bunches of green curly kale, ripping out the stems and tearing large chunks into bite sized pieces before storing in a large Tupperware or ziplock bag. 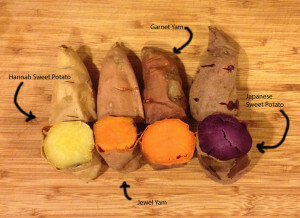 Then I roast 6-8 sweet potatoes (all varieties) at 400 degrees for 50 minutes or until cooked through. I simply store these on a plate in my fridge for up to a week. When half the meal is already made, chopping an apple and steaming some kale before running out the door sounds as difficult as what? Nothing, because it isn’t difficult. No excuses. A Simple Breakfast of Steamed Kale, Sliced Apples and Roasted Sweet Potato. In a small pot fitted with a basket steamer, steam kale for 5 minutes over medium high heat until tender. Transfer kale to a sizable bowl, large enough to hold your whole breakfast and position it to the left, or the right, whatever your prefer, just so that one half of the bowl remains empty. Layer your sweet potatoes and apples into the empty side of the bowl and sprinkle with cinnamon and flax-seed meal (or toasted walnuts), following with a nice dash of your good fancy pants salt (I use this one). That’s it! Really simply, but darn tasty. 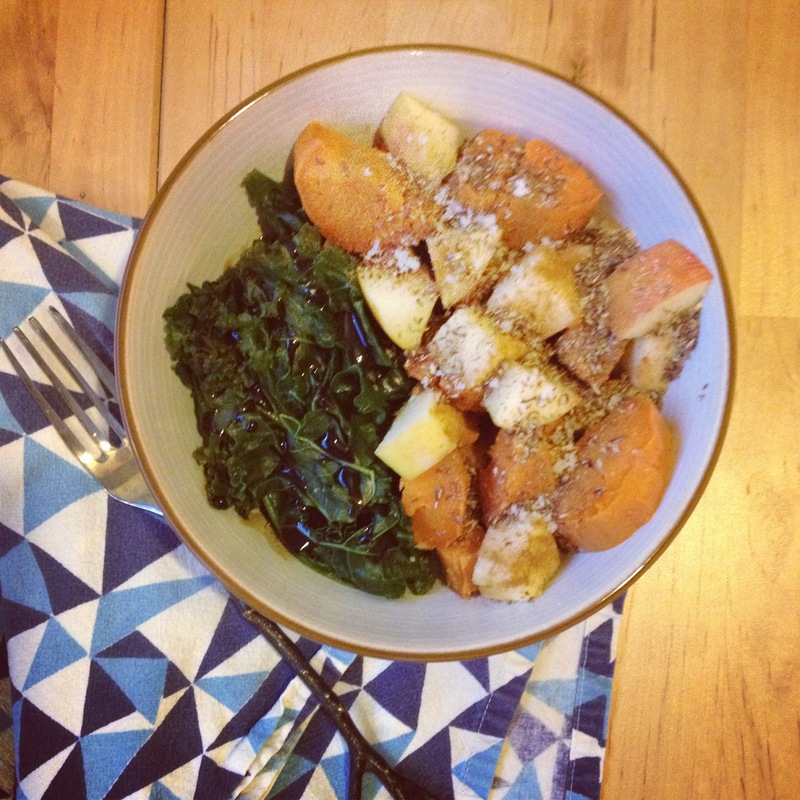 The fiber in the kale and apples will get things, um, moving, and the complex carbs found in the sweet potatoes will fill you up without a nasty sugar crash. Sweet Potatoes are an excellent source of Vitamin A, not only good for your eyes, but also for protecting your skin from sun damage, something super necessary here in Oregon.